What: The Urban Picnic, presented by the Atlanta Street Food Coalition, will return to the Sweet Auburn Curb Market this week. The monthly event is held on the last Friday of every month and gives citizens of Atlanta a rare opportunity to sample and experience street food from over a dozen of Atlanta’s aspiring gourmet street food cart vendors including, Burro-Pollo Chicken Burrito Stand, Good Food Truck, King of Pops, The Pickle, Souper Jenny, Yumbii and more. The coalition hosts monthly events to help foster a strong street food culture in the city of Atlanta and to bring attention to the need for food trucks throughout the city. The Atlanta Street Food Coalition’s ultimate goal is to lobby for and see implemented a regulatory system that encourages food trucks and street vendors who will bring healthy food options to areas of the city that are dominated by convenience stores. It is the Coalition’s belief that this movement will create new and exciting businesses in previously undeveloped and underserviced areas. A not-for-profit organization with one mission: Bringing Atlanta's thriving restaurant community into the streets via food carts and trucks. The Sweet Auburn Curb Market, located at 209 Edgewood Avenue SE, Atlanta, GA 30303, hosts merchants selling fresh vegetables, meats, prepared foods, and other dry goods six days a week, year-round. Cafes and a fair-trade coffee shop make the Market a regular daytime destination. www.sweetauburncurbmarket.com, or 404.659.1665. Yesterday I mentioned that I picked up a sweet (and brand spankin' new!) men's GAP button-up in olive green. Can't wait to get a nicer camera! I thought this necklace would be perfect for this outfit. It feels very African-inspired. While I call it a twig or pretzel stick necklace, it's actually some kind of very tough fiberglass-like material. Speaking of What I Wore's Safari challenge, I am so excited to be introduced to Seven Dollar Pants, a blog led by a dynamic Toronto duo. Christine (below) was the fave outfit of the What I Wore challenge. She called this outfit her "Zookeeper" look. I can tell these gals are going to be very inspiring! They're thrifty, creative and stylish: three of my favorite things. With fam in town for our little housewarming shindig, we just had to fit in a little thrifting time. Thank you to Paul for spearheading the adventure. We had quite the successful day at ole G'Willy. Paully Wally, Mom, Anna Fo-fanna. Mom really racked up on this particular trip. She's always been a fan of black and white (or black, white and red) — and the Lavista Road (Tucker, Georgia) Goodwill had plenty waiting for her. Isn't she adorable in this wide houndstooth belt? 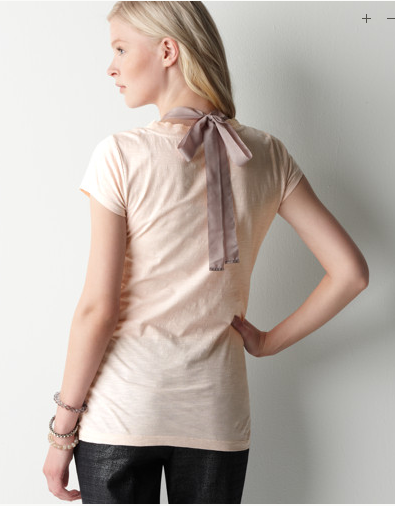 The mama hasn't done much with high waisted belts — but now she's ready to rock this one ($4). See far below for her whole cart. Another fun find by la madre. 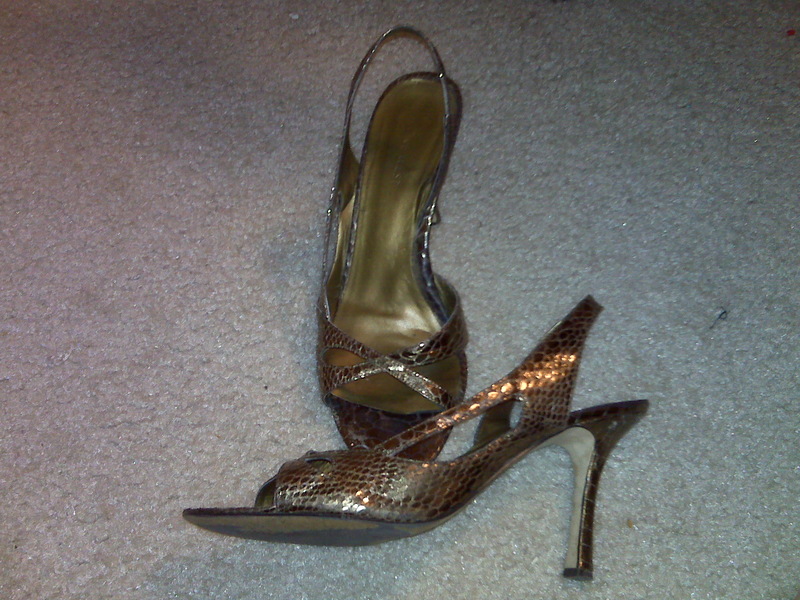 These Rampage brand kitten heels had never been worn. Love the oversized houndstooth pattern and the little bit of grey mixed in ($6, I think). Anna was also a big winner in Sunday's thrift excursion. I sooo wish the below shoes had been my size. 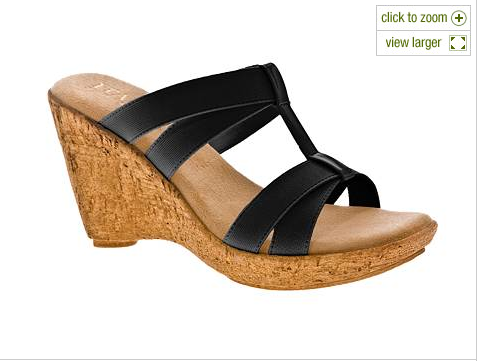 Alas, they were not right for me but perfect for Anna. These $10 shoes remind me a lot of these precious black leather ones (below) from Shabby Apple (shout out to the Asian Cajuns for telling me about the cute offerings of Shabby Apple). Anna's are just as cute but $90 less. They also remind me a lot of these sassy red shoes Olivia shared for Audience Participation Friday a few months ago ("Favorite items under $20" edition). And a men's polo, three books (Memoirs of a Geisha, Diary of a Freedom Writer and Teaching Students with Special Needs) and a ceramic coffee mug. Her total damage: $24. I also came home with a men's button-up. 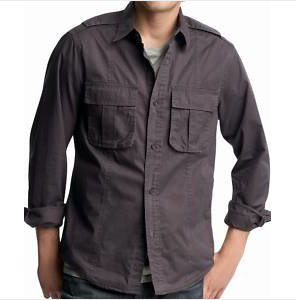 I was lucky enough to find a GAP brand olive green, two-pocket safari-style button-up much like the one below. NEW WITH TAGS (marked $44.50). Goodwill had it marked for $10 — then I got half off at the register because it had a red tag. Five bones for a brand new shirt ain't bad. I'll share my outfit post incorporating the shirt tomorrow. I also bought a purple knit vest by Casual Corner ($4) and three books (I Know This Much is True, The DaVinci Code and Revolutionary Road). Thrift stores are such a great place to find books for cheap, even new releases. My total damage: $12. Paul found a jackpot item as well: a mint condition, red North Face rain coat for $5. I know the frat boys at The University of Georgia are going to be mega-jealous. Note: the LaVista Rd. metro Atlanta location is one of the cleaner, newer, more organized Goodwill locations. Even the bathrooms seem to be in fine shape. Yesterday, I posted on my other blog ("Katy Streams Her Consciousness") that we had a little housewarming party slash cookout on Saturday. What does one wear to a late June housewarming party? Well, I think we can confidently look to my friend Lauren, who looks absolutely adorable for anything and everything. Such fun and feminine details. I love that the shoes are slightly pink but still neutral. Black shorts from H&M ($25), four-year-old black satin espadrilles from Old Navy ($12, I think), linen Safari-ish top from Ross by Ecologie ($14) and a black/brown/gold costume necklace I found on eBay a few years ago for $8. Aren't you jealous of our astro-turf patio? What would you wear to a cookout or summer housewarming party? Gotta tell you locals about Sweet Elegance Bridal. No, I'm not renewing my vows after less than two years; I went wedding dress shopping last weekend with one of my besties. I digress. When Megan did her preliminary wedding dress hunting online, she kept seeing that the dresses she liked were carried at a Decatur shop called "Sweet Elegance." So she made it the first stop on her wedding dress journey. Sweet Elegance is a small bridal boutique on Church Street in Decatur, Georgia. Amidst a sea of car dealerships, you could almost miss this gem of a shop -- not to mention its simple black awning and strip mall locale doesn't do its interior or experience any justice. The store specializes in dresses from $400 to $5,000 in a variety of styles and cuts. The shop is owned by a mother/daughter team. Aimee, the mother of the duo, opened the shop about five years ago when she felt a void needed to be filled in Atlanta. She and her daughter felt as though all the bridal boutiques were overpriced, provided horrible customer service and/or didn't carry flattering and elegant styles. When a bride makes an appointment at Sweet Elegance, she isn't rushed or pressured to try on dresses far out of her price range. Also, because the boutiques are experts at understanding the female body, they choose the dresses they feel would most flatter the bride. Megan's experience was no different. She only had to try on four dresses to find "the one." Aimee showed us how Megan could alter the skirt of the dress for an even more "wow" silhouette. The sales staff was friendly and courteous and really made the experience feel special for Megan. She tried on veils and earrings and even did a little silly practice walk "down the aisle." And her mom was comfortable with the price. 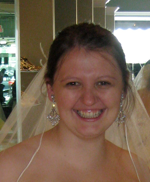 Of course I can't post a photo of Megan on this blog until after her Spring 2011 wedding -- but I CAN show you a teeny crops of a photo. Isn't that the face of a gal who's found the right dress? Mike is going to have his socks blown off when he sees her walking down the aisle! Appointments Mon. - Wed. from 10:30 to 6; Thurs. - Friday 10:30 to 7; Saturday 10 to 6. Closed Sundays. Tuesday night I got together with a couple of neighborhood ladies. I'd never met Traci before — but I'd wanted to because she's an avid commenter on my blogs. She's also finishing a STUNNING renovation on her Emory-area home that I knew would be fun to talk about. 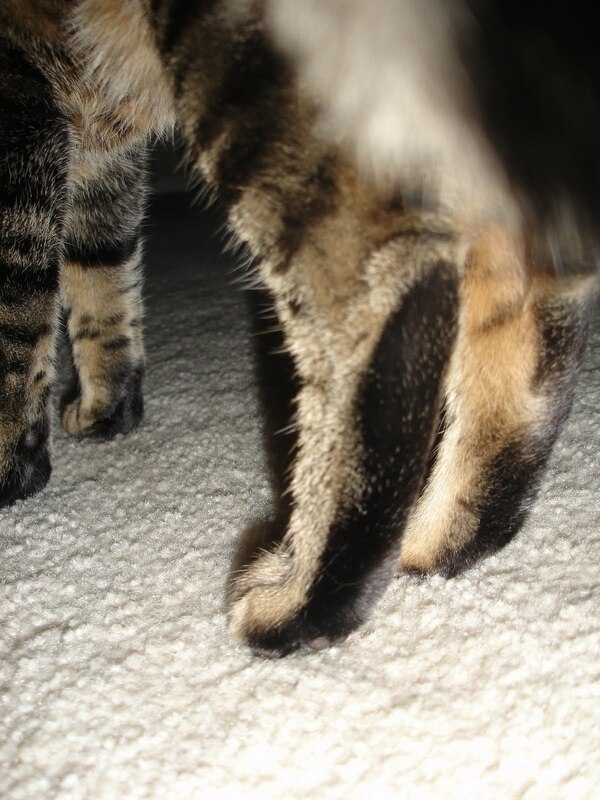 The other two ladies were Vica and Naomi. They're both expecting, both owners of older homes they're updating, both Decaturites as well. So I knew we were in for some fun discussion. This was maybe my fourth or fifth time to Leon's Full Service (Church Street at West Ponce in Decatur). It's fun, it's lively, the food is always good and the beer offerings are always interesting. So the downtown Decatur locale is easily one of our go-to spots in the 'hood. Leon's is also great about splitting entrees with no upcharge. Naomi is a regular, Traci had been a few times — and Vica had it on her short list of new places to try. The other ladies took advantage of Leon's highly acclaimed mixologist on duty. 'Twas the $9 Peruvian Punch for Traci (she was assured by the waitress that the drink wasn't too sweet, like what you think of when you hear tropical punch). Naomi ordered a ginger soda concoction ($5) she's asked the bartender to make before — and Vica quickly followed with, "I'll take one of those, too!" No reason a pregnant girl can't get a fancy drink from the bar! Food-wise, of course we had to start out with the pub frites ($6). None of us gals are picky, so we had trouble deciding which of the 8 - 10 delicious sauces to choose from. I suggested the massaman curry as a good choice — and Naomi chimed in that the goat cheese fondue is one of her faves. The waitress was nice enough to bring us a third dipping sauce (smoked tomato mayonnaise) gratis. Thank you, waitress! And I swear that the silver cup of fancy french fries gets bigger every time I go to Leon's! This time we four gals struggled to finish the whole pile but somehow prevailed. Mmmm. Perfectly golden, salted just enough — and even more divine when plunged into the tasty sauces. Traci decided to try to the crispy skin trout over a bed of coleslaw, radicchio and endive ($14). Her verdict: very tasty and light. Even though Traci's not usually a fan of coleslaw, she enjoyed this particular variety because of a flavorful asian dressing. Naomi went for the bone-in pork chop ($17). Does that look delish or what? The waitress warned the pork chop's sauce was a little spicy — but Naomi didn't let that scare her. While it was indeed spicy, Naomi enjoyed the green curry sauce the pork chop laid in. She wasn't crazy about the grit cake or its texture. The verdict: rather good, but probably wouldn't order again because of that pesky grit cake. Vica has been on a veggie sandwich kick for the last several months (pregnant women are not supposed to eat deli meat because of possible listeria in it). Even though the meat sandwiches at Leon's (open-faced BBQ, shrimp gryo, etc.) aren't deli meat ones, Vica was feeling this roasted fresh veggie hero. The verdict: thumbs up, especially on the orzo side dish. As much as I tried to talk myself out of it all day leading up to dinner, I still ended up ordering the veggie loaf (a veggie take on a meatloaf). It's so freaking good! Sundried tomatoes, cauliflower, several types of mushrooms, grains... I have a not-so-secret love affair with this freaking dish! ($14) And I had enough to bring home half to Dan (he thoroughly enjoyed). The total damage for me: $28 plus tip (for a quarter of the pub frites, a quarter of the bacon, two beers and an entree). Leon's, you have my heart! Warning! You are leaving the typical <$50 zone! Earlier this week, I asked you all to send me pictures of your favorite new and/or summer shoes for Audience Participation Friday. And you sent me some great ones! to Neiman Marcus. He said that I had to buy myself a pair of Manolos. he sat with me while I tried on dozens of pairs to find the right one. 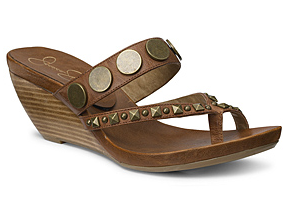 Casual yet edgy summer sandals by Jessica Simpson ($59). Style is Ninja. Elizabeth hasn't actually bought these yet... but she's promised me she has to. Angel platforms by Franco Sarto ($89). 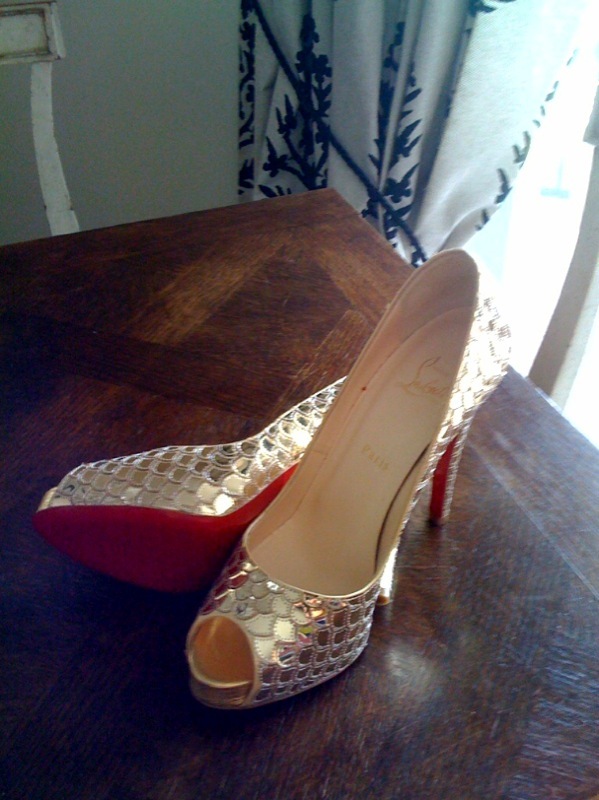 Fresh from the LA Neiman Marcus (the only Neiman to get this particular style in), these Christian Louboutin prive pumps are magical. 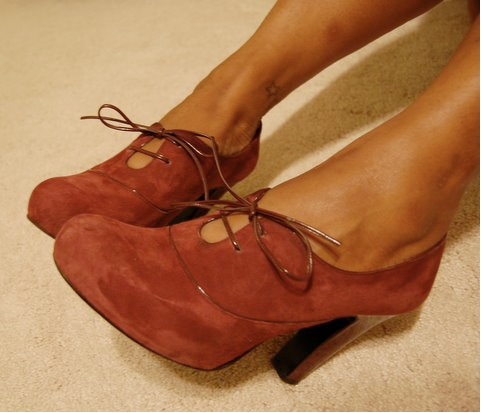 (Here's a post by The Accessory Junkie about this particular pair of shoes). Here are the new ones I showed a sneak peak of on Monday. I am excited about the caramel color, the platformness (new adjective) and how they make my feet look especially feminine. Sandals are Diba — found them at the cutest little shoes/clothes/jewelry/decor store in Panama City when I was there this past weekend. I can't decide if I should be mad at or grateful to my sister-in-law for introducing me to this place. 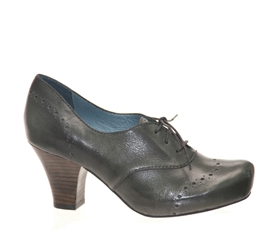 ($58 on sale from $76) I like the shoes a lot and may have to explore getting more from this company. Lauren (a shoe collector I respect very much) tells me she has some Diba sandals she loves. 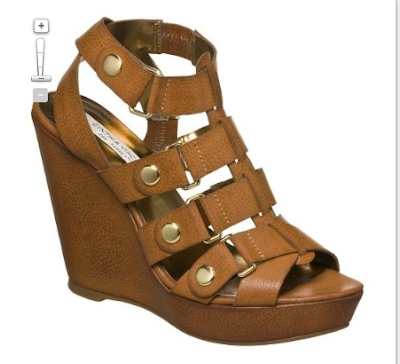 Don't they a little bit remind you of the (sold-out) Cynthia Vincent for Target wedges ($29.99) I've been lusting over? Would you believe they're selling on eBay for upwards of $120?